Now, you might think: well, that’s all fine and good for Non-Fiction, but I write FICTION! I agree that it’s a bit easier—or at least more straightforward—in the case of non-fiction, but this principle applies to fiction as well. I’d like to stress that I’m NOT discussing politics here. Whichever side of the (sizable!) political divide you personally come down on, you can see the hook here, and it’s a powerful one. Of course you might think: but 1984 is a classic! I write light-hearted romance. It doesn't matter! The same principle applies. Why do people read your book? What does it do for them? Perhaps it helps them forget how ordinary their life is. Perhaps it allows them to vicariously experience exotic locales as well as the thrills and chills of being swept off their feet by a handsome stranger. That’s quite the invitation! By the way, at the time of writing, this book sits at #460 in the paid Kindle Store. According to the Kindle Best Seller Calculator this works out to about 194 copies sold per day. At a 35% royalty this means the book earns about $103 per day. Not bad! In any case, enough preamble. Here are 7 tips for writing a book description that will show your work in its best possible light and, because of this, turn browsers into buyers! Before we get into this let’s look at what I think is an effective non-fiction book description. It’s from Grit: The Power of Passion and Perseverance, by Angela Duckworth. 1. Hook Readers With the First Sentence. Does the first sentence grab readers? Does it hook them? Does it pull them in and compel them to read the next sentence? The book's promise is right there: You don't need talent to succeed! Read this book, discover what grit is, and you too will learn the secret to outstanding achievement." Notice that the first sentence is in bold and that it communicates the promise of the book: Read me and you’ll learn “how to live more and work less.” I’ve noticed quite a few descriptions have the first sentence in bold to help it stand out. Some descriptions also increase the font size of certain key sentences in order to draw attention to them. 2. Include Your Book's Keywords in the Description. Keywords are important because this is part of what determines whether your book will show up for particular searches. When you publish your book you’re asked for up to seven keywords. Work as many of these into your description as you can. Some authors also bold or underline one or two of the most important keywords. Many times you can get a good idea of the kind of keywords books in your category use by simply looking at the categories that the best selling books succeed in. If you have the time it's also a good idea to copy, say, 10 of the best descriptions for books in your category and run them through a program that reveals which words are used most frequently. 3. Make Your Book's Description Similar in Style to the Best Sellers in Your Genre/Category. Does your description look similar to, have a similar style to, the description of the best selling books in your genre/category? If not, study the descriptions of the best sellers. Not all of them will sparkle, but pick the best and see how yours differs. Then tweak yours. Don't be discouraged if you don't get it right the first time! Also, make sure your book's description communicates the book's genre and subgenre. Let friends and your fellow writers read your description and give you feedback. Share your description with your social networks. You can also work up different versions and ask folks to choose which one (A or B) they like better. One tip I've received is that, for ease of reading, each paragraph should contain no more than 2 or 3 sentences. 5. Remember That a Description Is More Than a Summary, It's an Advertisement! Does the description highlight the book’s benefit for its intended audience? In other words, did you tell the reader what your book can do for them? What is the reader’s problem? Be genuine. Show your readers you've be through what they're going through, that you understand them. How will your book fix their problem? How will it make the reader [insert modifier: wealthier, happier, more productive, etc]? 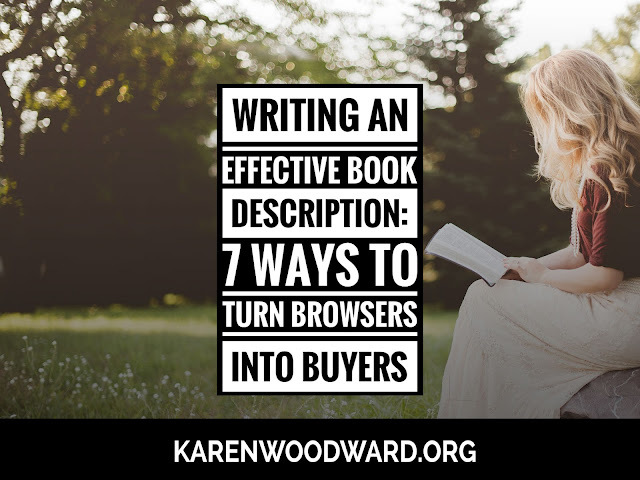 Make sure you list the benefits a potential reader will get if they read the book and implement the advice. Include bullet points that communicate, say, the 3 most important benefits of your book, the three most important things it can do for readers. Why is this book the best book they could read on this topic? Help your book stand out from the crowd. Try to make a personal connection with the reader in the book description. If the book is intended for a certain age range, include that information. The more accurately you can target your intended audience, the better. 6. Include an Elevator Pitch. This point applies more to fiction than nonfiction. Don’t give away too much information. If you have a number of cliffhanger moments in your book (perhaps the first one occurs around the Lock-In) then take the readers up to the first cliffhanger. See: How to write a kickass book description. 7. Update Your Book's Description. Update your bio to reflect the content of your book. Update your book’s description as you get reviews, etc. Also, if you’re running a promotion, don't be afraid to put it in the description! Today I want to recommend a book by one of my favorite writers: Norse Mythology, by Neil Gaiman. From the blurb: "Through Gaiman’s deft and witty prose emerge these gods with their fiercely competitive natures, their susceptibility to being duped and to duping others, and their tendency to let passion ignite their actions, making these long-ago myths breathe pungent life again."